While our kids will eat fruit and muffins and hummus and veggies I put in their lunchboxes, I like to also give them a snack bar once in a while. 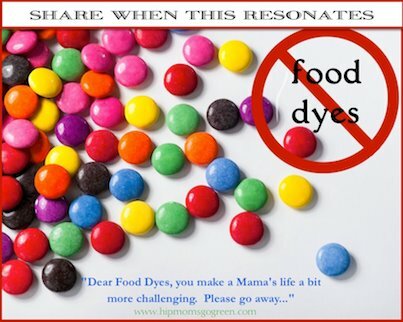 We all know that it’s next to impossible to find candy in the store without artificial food dyes. But even so-called “natural” snack bars have artificial flavoring and other objectionable ingredients. Did you know that Nutri-grain bars have artificial colors? I was shocked to see this. There are so many others out there. Thank goodness for food labels. I like Larabars because they usually have a list of 5 ingredients or less. But at $1.29 each, that can get cost prohibitive. Even with coupons or through my food co-op (when not on “super sale”), it is tough to justify spending $.90 for a little bar – when you can make it yourself! 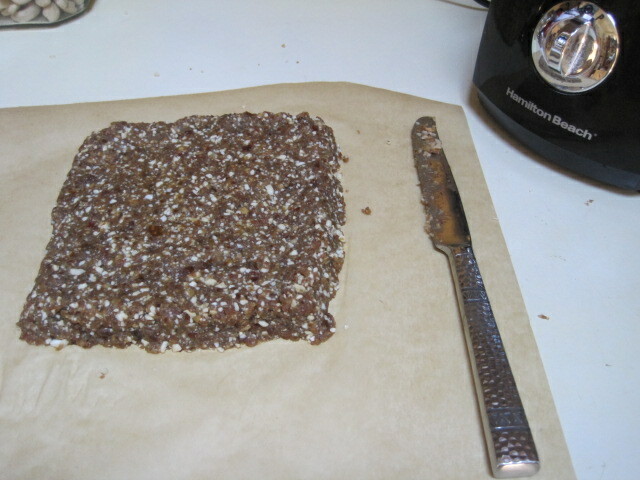 I discovered an easy, homemade, healthy alternative-to-packaged snack bars to mix it up for this coming school year. 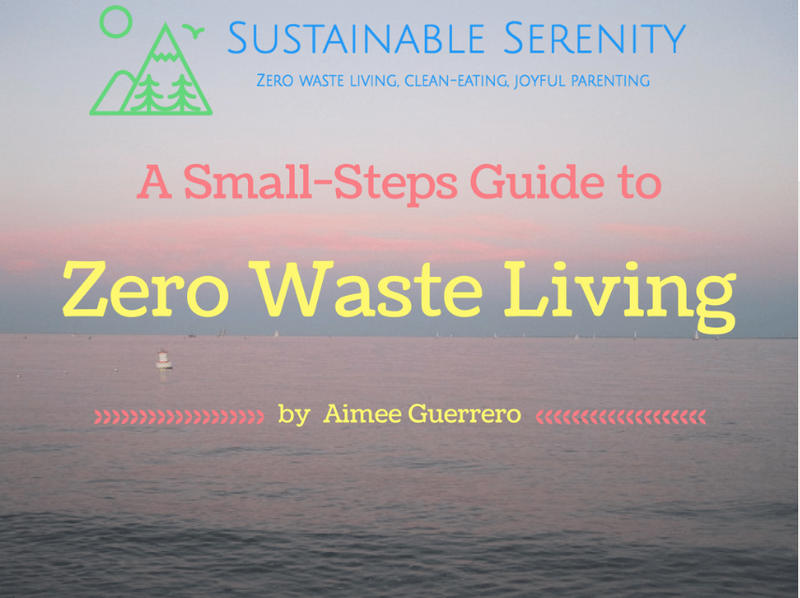 Away with you, so-called natural granola bars with artificial colors and flavorings! 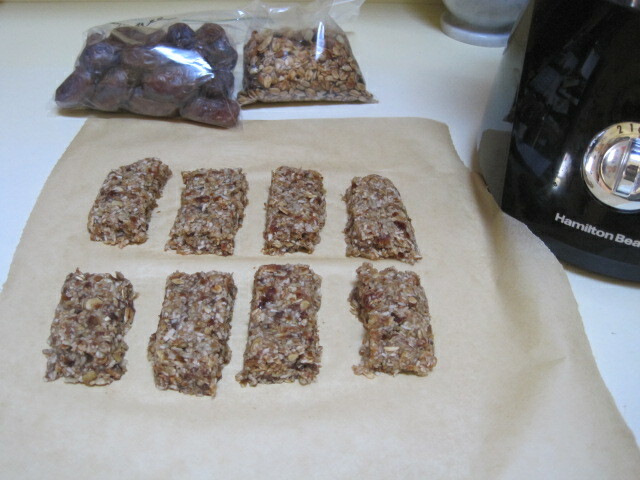 Here are three homemade Larabar recipes, courtesy of the 100 Days of Real Food blog. This summer, I made the first two of the following recipes and they are a huge hit with all five of us in our family. With the routine of packing school lunches on my mind, I share these recipes with you as an alternative to sugar-sweetened snack bars. Medjool pitted dates are a healthy alternative to processed sugar or chemical sweetener and can be found in the bulk section of Whole Foods Market. I bought them there, when I first tried the recipes. They are cheaper through my food co-op. (Contact me, if you’d like more info on joining the co-op.) I haven’t yet tried to find them at ShopRite or Stop n’ Shop, but will be sure to update this post if/when I do. Read about the health benefits of Medjool dates. So far, I’ve experimented by adding different ingredients on hand such as shredded coconut, dark chocolate chips, cocoa powder, and cranberries. Wrap them individually in waxed or parchment paper and stack in the fridge for your child to put in her/his lunchbox. 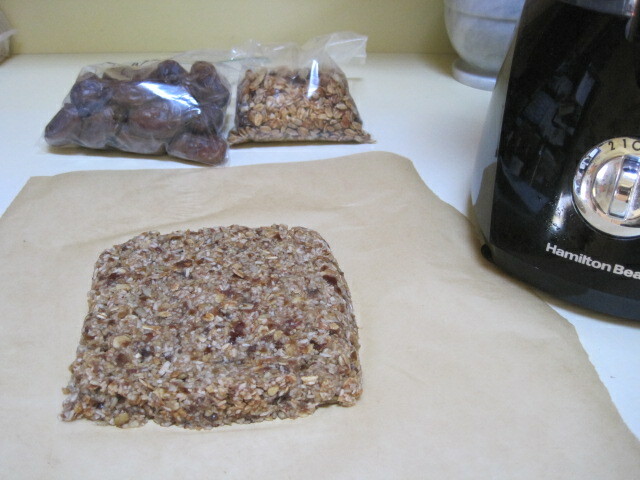 Here I used granola from “Health in a Hurry” that I bought with a whole bunch of good stuff with my Fairfield Coupon. 1. Combine granola, dates and water in a food processor and puree until mixture starts to stick together. Add a little more water if necessary to help mixture come together. 2. Pick up date mixture and using your hands work to squeeze it together into one big clump. Mash it down on a cutting board or sheet of wax paper to form into one even rectangle shape using the sides of your hands (or a knife) to make the edges straight. 3. Slice into 8 even bars. For best results store in the fridge, although bars can be kept at room temperature. 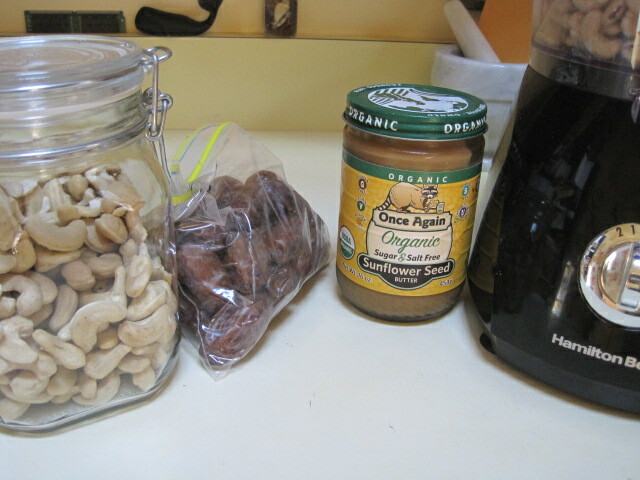 I used raw cashews that I bought at “Fountain of Youth” with my Fairfield Coupon. Sunflower seed butter is a favorite alternative to peanut butter in our house. 1. Combine dates, cashews, nut/seed butter and water in a food processor and puree until mixture starts to stick together. Add a little more water if necessary to help mixture come together. I photographed the container of cashews to make certain that I knew these were the cashew cookie ones. 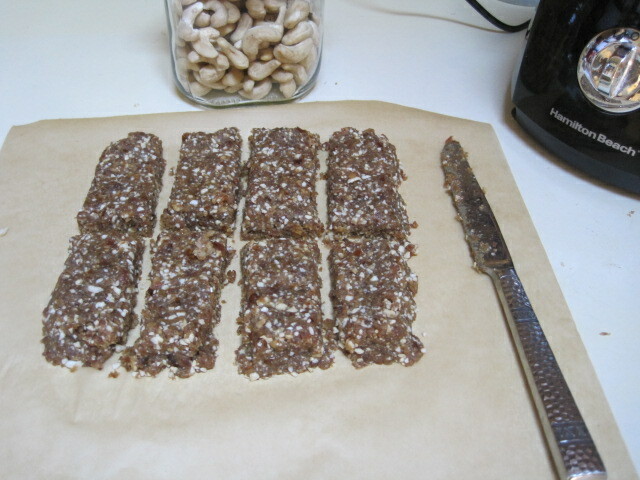 These taste just like the store-bought Cashew Cookie Larabar! 3. Slice into 8 – 10 bars. For best results store in the fridge, although bars can be kept at room temperature. 1. Combine seeds with olive oil and salt and mix together thoroughly. Toast coated seeds in toaster oven, a pan on the stove (on low heat), or standard oven on 350 degrees F until slightly brown. 2. Combine toasted seeds, dates and water in a food processor and puree until mixture starts to stick together. Add a little more water if necessary to help mixture come together. 3. Pick up date mixture and using your hands work to squeeze it together into one big clump. Mash it down on a cutting board or sheet of wax paper to form into one even rectangle shape using the sides of your hands (or a knife) to make the edges straight. 4. Slice into 8 even squares. For best results store in the fridge, although bars can be kept at room temperature.